Let me start by saying I know it's been several days since Memorial Day but hey sometimes blogging has got to take a back seat to other things in your life. For instance the fact that we've been bailing water out of our dishwasher for the past 3 days has not left me much time for blogging. Anyway, this year instead of the traditional hot dog and hamburger BBQ we usually have on Memorial Day we decided to try something new. Part of that was due to the fact that my husband and I decided to spend Memorial Day alone this year. No pool party, no out of town guests. Just the two of us with a lot, and I mean a lot, of time on our hands. So we did what we do best and cooked or I should say grilled. We started out with a pear, walnut, feta salad topped with a honey lemon vinaigrette. We make this salad a lot in our house switching out apples for the pear or blue cheese for the feta depending on our mood. Mix together first 4 ingredients. Slowly add oil while whisking. Top lettuce with pear slices, cheese and nuts. Pour dressing over top. We followed the salad with a 7 lb maple bourbon chicken. I'm not sure where I got this chicken recipe but it's something we've been making for a few years now. It's such an easy recipe and the chicken always comes out very moist and flavorful. In a small bowl, combine all glaze ingredients. Set aside. Rinse chicken and pat dry. With poultry shears or knife, split chicken length ways along one side of backbone. With breast side up, pull up on two sides of back and press down firmly on breast until bones begin to crack and chicken is reasonably flat. 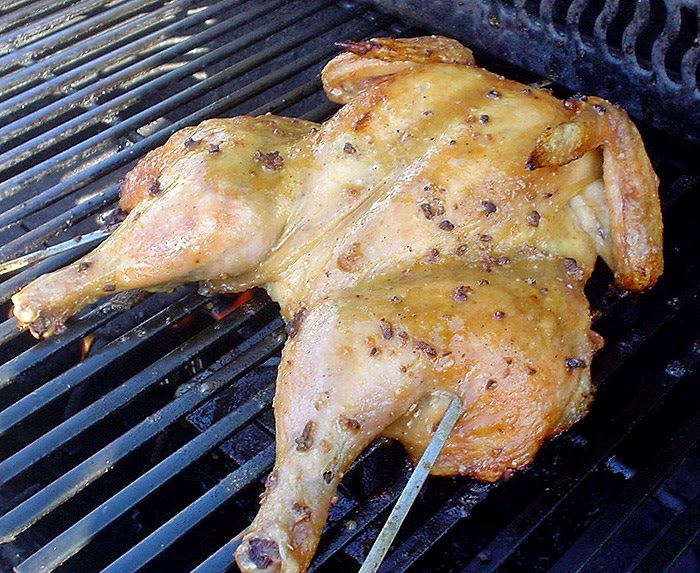 Thread two sturdy metal skewers crosswise through flattened chicken; skewers should run perpendicular to thigh bones, through the breasts, and through the middle of the large wing joints. Combine oil, garlic, salt, and pepper; brush evenly on both sides of chicken. Place chicken, skin side up, in center of cooking grate. Grill 1-1/2 to 1-3/4 hours or until meat thermometer inserted into center of thigh meat (but not touching bone) reaches 180°F/82°C (170°F/77°C for breast) or until juices run clear and skin is well-browned, brushing occasionally with glaze during last 20 minutes. On the side we had some grilled asparagus wrapped in prosciutto and speck; topped with a citronette sauce. 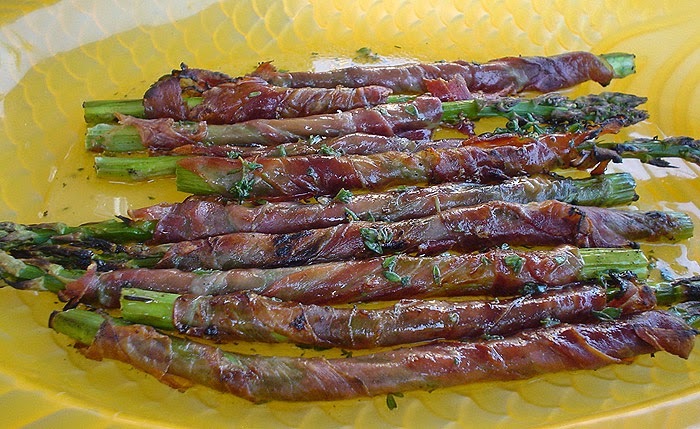 This was adapted from a Mario Batalli recipe that called for the asparagus to be wrapped in pancetta. We just happened to have prosciutto and speck in the house so we figured why not. All 3 meats go very well with the asparagus and the citron sauce really pulls it all together. Also on the side we made Alton Brown's recipe for creamy garlic mashed potatoes; which turned out really good. So although not traditional BBQ fare we still had a great meal made primarily on the grill. The asparagus looks great. I bet it would work with bacon too! Wow, these all sound amazing! :) I've never tried grilling a whole chicken before. Gonna have to keep that in mind!